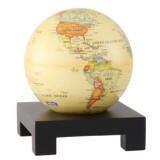 MOVA spinning globe uses solar power, as well as the force of planet earth’s magnetic field to perpetually revolve on virtually any* surface. 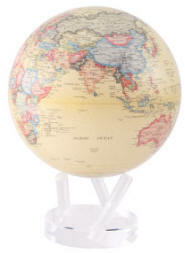 The globe rotates in continuous motion as if by magic on an elegant clear acrylic stand. No batteries or wires are required. 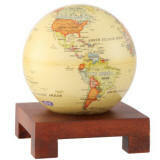 This unique spinning earth globe makes for a truly stylish and exceptional gift or corporate award. 4.5 " MOVA Globes are also available with elegant optional Bases (seen below), including Crystal stands, suitable for engraving. 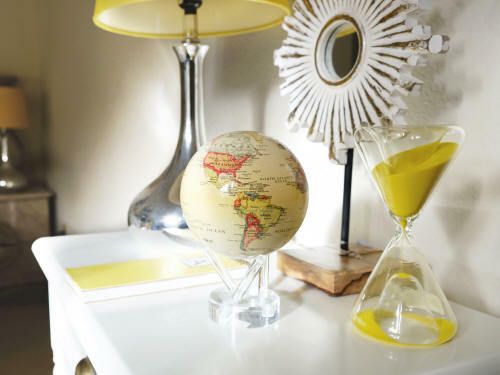 The MOVA globe rotates peacefully and silently using only the energy of room light and the force of the earth’s magnetic field. MOVA Motion Within: the globe is actually an inner globe that rotates and is contained within an outer shell made of very clear acrylic that does not rotate. 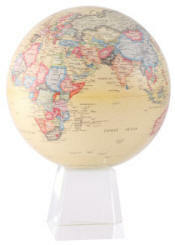 The thin space between the inner globe and outer shell is filled with a safe, perfectly clear fluid that buoyantly supports the inner globe completely out of contact with the outer shell. This inner globe, floating and turning in a virtually friction-free environment and energized by light, is analogous to the earth itself. 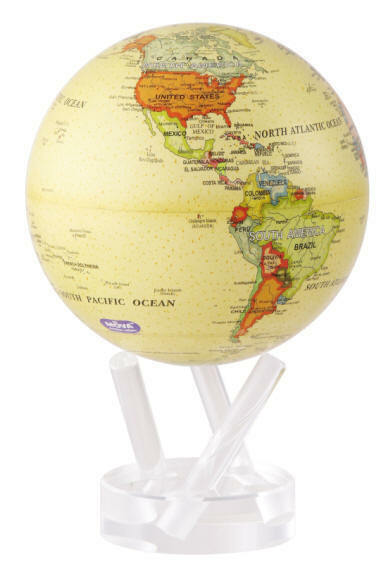 The optical properties of the outer shell and fluid are carefully chosen so that the graphic features on the surface of the inner globe are magnified and appear to be on the outer surface of the outer shell. This means that the outer shell actually appears to move. 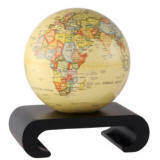 The MOVA globe can rest on an attractive three fingered stand that is provided, or on just about any other kind of stand that can be chosen to complement it’s graphic design. 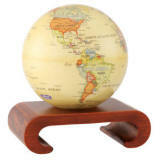 The MOVA globe appears to rotate in spite of resting on the stand, in quiet defiance of commonly held ideas about the laws of friction. A carefully designed, and highly efficient drive mechanism within the inner globe drives the rotation even in room light. Energy for the drive is provided by very advanced solar cells within the inner globe, illuminated by light passing through the graphic on the globe. The drive includes a magnetic element that reacts with the earth’ s magnetic field, much as a common compass does, to provide torque to drive the globe.